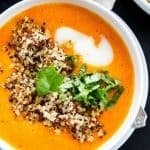 Thai Curry Red Pepper Quinoa Soup is an easy 30-minute meal made with red curry, coconut milk and quinoa. Skip take-out and make this healthy twist instead. In a large pot add all of the diced red peppers and shallots. Drizzle olive oil over the peppers and onions and place over medium-high heat. Stir to coat peppers and shallots in oil. Continuously stir over medium-high heat until red peppers are tender - about 8-10 minutes - depending on your heat. Remove from heat and add peppers and shallots to a food processor or blender. I do this in half batches to not over fill the blender. Add coconut milk, vegetable broth and red curry paste to the food processor or blender with the peppers. Blend on high until soup is completely smooth, about 45-60 seconds. Pour soup back into the pot that you used to cook the peppers, and season with salt and pepper. Cook over medium heat for about 8-10 minutes. Serve in bowls. Add 1 cup of soup, top with 1/4 cup of cooked quinoa and garnish with cilantro and a dollop of coconut yogurt, if desired. Optionally, you may add the quinoa and cilantro to the pot, stir to combine, and serve.